So after having fully recovered from the sated effect of the Berry crumble that my colleague Aarti had made, I rolled up my sleeves and got down to work. No not my job, I meant the competition at hand – The Bake off! And my oh my. What a surprising episode this was! We won Bronze in the Bake Off. Not too shabby at all. I think that was fair as far as our food was concerned, especially given the fact that our team was taking on 2 colleagues who also baked professionally for a living, who by the way won the top 2 spots. But presentation wise, not fair at all. I whole heartedly disagree with the judges. I would like to think we were hands down the best of the whole lot, presentation wise. My team name is ‘Renaissance’. So we selected our theme to be Italy, which was the birth place of Renaissance, or as the Italians would call ‘Rinascimento’. We decided on our Novelty item to be a ‘Pizza Cake’ and for the muffin variety, Feijoa muffin with Lime Glaze. We did realise Feijoa might not be Italian, but it was in season and we thought we need to be refreshingly different to those of the other teams who were clichéd enough to present Blueberry and Chocolate Chip muffins. 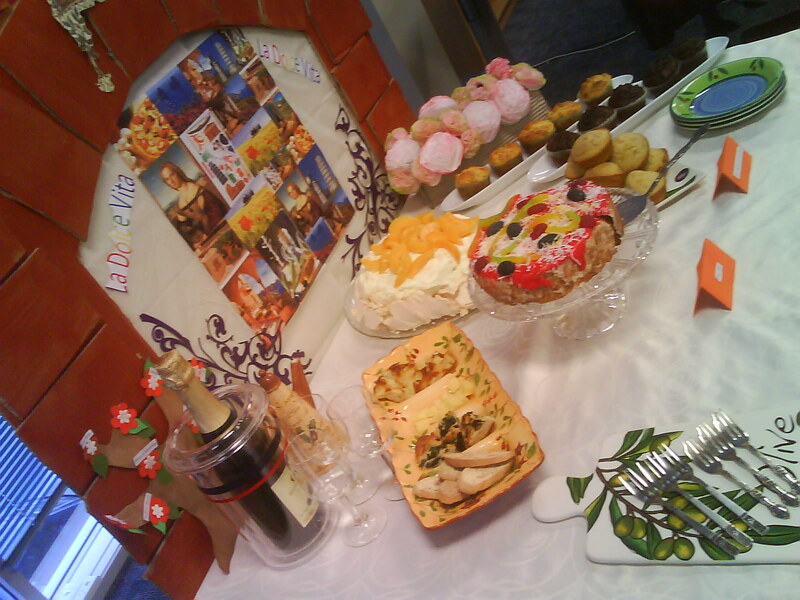 In addition to this, we enhanced our presentation by each of us baking more items, to give a fuller looking table, like a typical Italian table. With a whole array of food, we wanted to extend the idea that Italians never did things by half and created masterpieces in whatever they did, which was in extension of our team motto “Every call is a Masterpiece”. The preparation process was so energizing and a fantastic outlet for creativity. We decided that our table was going to look like something right out of Italy, rustic, beautiful and be adorned with food, art, flowers, serve ware included. But to make ourselves stand out, we decided to build the top half of an archway over our presentation board. One of my colleagues even went on to suggest, that we need to challenge ourselves and even make hand-made flowers. And anxiety bells started ringing! Origami and me! Bad idea! It’s like me trying to pop a wheelie! But we had to get our act together and pitch in especially with the clock ticking closer to our deadline. A couple of my colleagues worked on the archway, Aarti, the berry crumble expert decided to take on the Pizza Cake head on and Kim who by the way was also working on the Archway, said she will bake the Feijoa muffins. And me, I had volunteered to bake Almond Biscotti for an authentic Italian item on the menu, to make things harder than it already is for me, I even chose a traditional Italian Biscotti recipe. 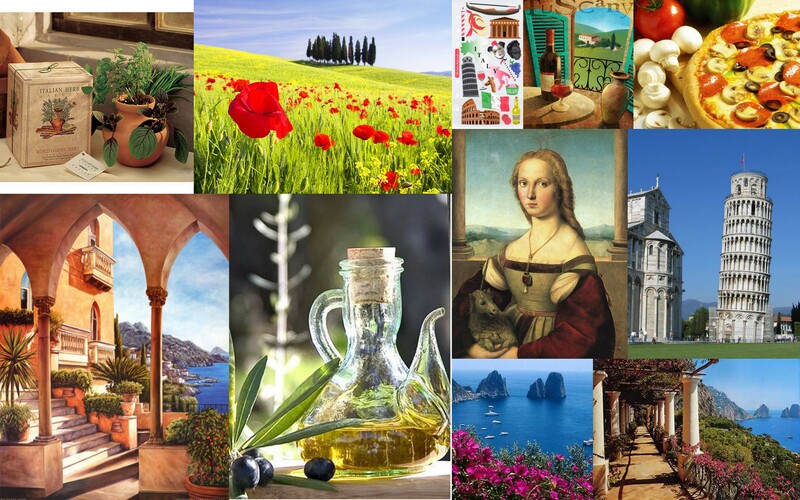 I also worked on a picture collage of all things Italian and I got my boss to print it off in an A3 paper in colour to be put up on the board like a poster /painting. On top of this I volunteered to help with the hand-made flowers as well. I got so carried away with the ongoing excitement and planning, I committed myself to it without realising what I was getting into. Yes! Oh the irony of it. Dont even ask! During the closing hours at work, I tried giving the instruction sheet a glance on how to make those pretty paper carnations. I gave up trying to make sense out of it. 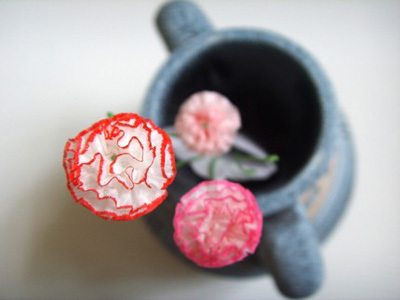 How on earth was I going to make paper carnations from delicate pink tissues with pipe cleaners. We had less than a sleep away to present. I printed off the instruction sheet for the carnations, rushed back home, had dinner. Fortunately, forever my knight in shining armour Ram, helped me with the baking. The dough for the Almond Biscotti turned out to be perfect. 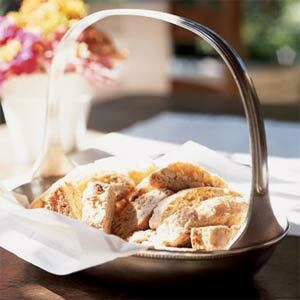 I stuck the biscotti in the oven and started on the paper carnations. I read line by line from the instruction sheet and followed each process step by step and Voila..! Wonder of Wonders. There lay in my hand a delicate pink carnation with dark pink edges. What a proud moment it was for me! I realised that this bake-off was such a wonderful learning experience for me art-wise. Hurrah…….I felt great that I had learnt something ‘new’. Next day, the sun was hiding behind the clouds. Gloomy weather. Not good at all! Went to the office with a huge bag filled with all the presentation paraphernalia. And helped the team with the table and board set up. I came to learn about another piece of depressing update. My colleague who had left the archway outside the site to dry, as it was spray painted and the fumes would have been a health hazard, arrived in the morning to find that someone had removed it. She had to rush back home and bring fresh cardboard, re-cut the archway and the bricks. Since we all had to go back on the phones, my boss, being the ever gracious lady, got down on her knees and painted our archway in a rich terracotta red-brown colour. And she managed to arrange some time off work for some of us later closer to the presentation hour. The tension around me was so thick that it could be cut with a knife. It was emanating from all team members, I even ended up riling up a couple of them for the worse, when I shot down a couple of unaesthetic additions and removed it. 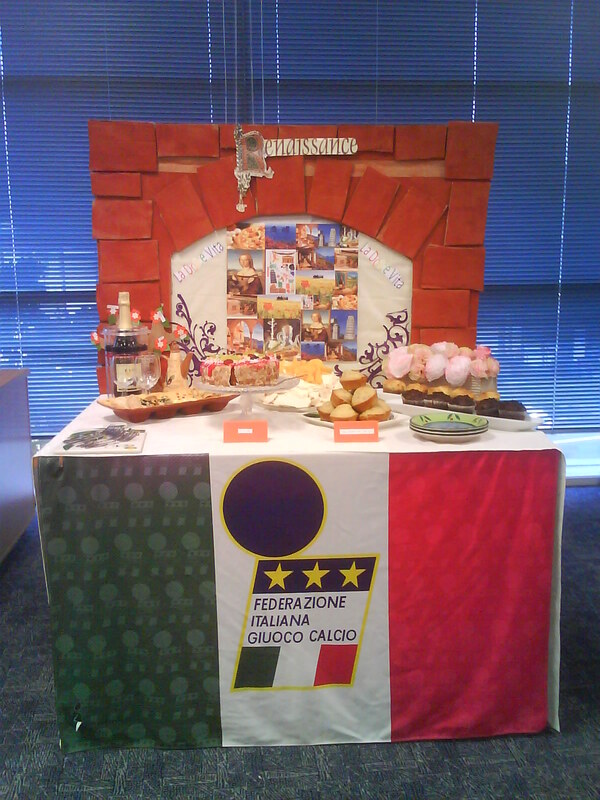 The judges came, we all greeted them in Italian and one of colleagues presented the idea behind the theme. They tried the main items and applauded our effort. And half an hour later, the winner was announced. We had come 3rd. I sent congratulatory emails to my team and we celebrated with the left over food. Exhausted and rooting for my bed and a good night’s rest, I was winding up for the day, clearing things away. One of the judges, stopped by my desk and said, “I liked your team’s presentation the best”. And I thought to myself -“Darn right you are. We were the best”. He went onto explain that the food had more points unfortunately. And that it was a great achievement that we had pitted against 2 professionals. And overall had done a good job. It felt great to receive this exclusive feedback. I was happy that he had taken time to come personally acknowledge the humongous effort. I thanked him, wished him a good evening and walked away smiling to myself, reflecting on the journey that this spectacular bake-off has been. And now, where was I? Oh yes. I need to catch up on that rest. Rat, this is by far the most super delicious n yummmy post…. Your writing skills are just fascinating and you should definitely write a novel someday!